They share more than just a love of medicine — they have unbreakable family bonds. Daniel Hoh, M.D., left, is a UF Health neurosurgeon specializing in complex spinal disorders. Brian Hoh, M.D., is the associate chair of neurosurgery at the UF College of Medicine and a cerebrovascular and endovascular neurosurgeon. They share more than just a love of medicine — they have unbreakable family bonds. 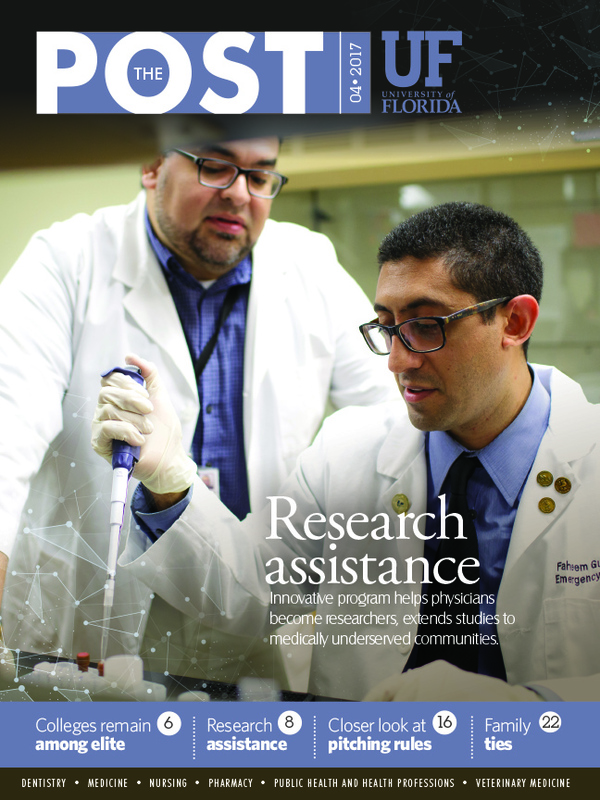 Husbands and wives, brothers, even parents and their grown children come together each day at the University of Florida to pursue their passions for healing and research with the added bonus of working near or alongside a loved one. Here are just a few of these special families. They sometimes tussled and threw rocks at each other when they were kids, but Brian and Dan Hoh were always close growing up. Their parents were first-generation immigrants from South Korea who settled in Omaha, Nebraska. Not surrounded by a lot of extended family, like cousins, aunts or uncles, the Hoh brothers, who are each other’s only siblings, fostered a close-knit relationship with each other and with their immediate family. Now, the brothers are both neurosurgeons pursuing their careers together at the Lillian S. Wells Department of Neurosurgery at the University of Florida, where they work in the same operating area, sometimes in adjacent operating rooms. Brian Hoh, M.D., FACS, FAHA, FAANS, who at age 45 is four years older than Daniel Hoh, is the James and Brigitte Marino Family Professor in Cerebrovascular and Endovascular Neurosurgery, associate chair of neurosurgery, and chief of the division of cerebrovascular surgery. Daniel Hoh, M.D., is an associate professor of neurosurgery at the UF College of Medicine. He is also the Dunspaugh-Dalton Professor in Brain & Spinal Surgery and a joint associate professor of neuroscience. “It’s been incredible to work together in the same department and be able to see each other at work every day,’’ Brian said. The brothers both graduated from Stanford University and from Columbia University’s College of Physicians and Surgeons. During medical school, Brian decided to take on an additional year of research at Columbia, allowing the siblings’ time in medical school to overlap. The brothers only went separate ways for neurosurgical training. Brian completed both his neurosurgery residency and an interventional neuroradiology fellowship at Harvard University at Massachusetts General Hospital. Dan completed his neurosurgery residency at the University of Southern California and a spine fellowship at the Cleveland Clinic. Although they studied similar fields, they said they were never competitive with one another. And as if they didn’t have enough in common already, both brothers were awarded endowed professorships from the UF College of Medicine in 2016, which will allow them to expand their research in their particular fields of study with a common goal of improving patient care. Dan said the funding for endowed professorships often comes from former patients who want to give back to the medical professionals who helped them. “The donor hopes that the excellent care they received will allow our faculty and department to provide the same or better care to our future patients,” he said. The James and Brigitte Marino Family Professorship now supports Brian’s research concerning patients with cerebrovascular disease. Through his professorship, Brian said he hopes to obtain a better understanding of the disease and potentially develop new therapies and treatments for patients in the future. Dan said his Dunspaugh-Dalton Foundation Inc. professorship in brain and spinal surgery will allow him to focus on improving care for neurosurgical patients. Though the brothers said they feel honored as individuals to have received endowed professorships, they believe the donors want to recognize the entire institution. “The great care these patients received didn’t come from a single individual. It came from multiple people who were involved,” Dan said.